Laughing out aloud, it was a fun-filled night as the 5th Annual Desi Comedy Fest had its third show at Santa Clara Convention Center on Saturday, Aug. 11. Seven comedians showcased a comedy extravaganza, spread across a diverse range of ethnicity, gender, religion and immigration. Started off by Samson Koletkar, who is also the co-producer of the show, the audience was quick to respond to his humor based on Indian households. As the majority of the audience were Indian, they could easily relate to the nuances of comedy based on Indian marriages, governance and traditions. But it was the first-timers at the show, Subhah Aggrawal and Ehsan Ahmad, who created momentum for the entire event. While Subhah captivated the audience with her experiences in Los Angeles, it was the humorous perspective of ethnicity and religion by Ehsan that enthralled the crowd. The other comedians that night, Dauood Naimyar and Akaash Singh, brought out the humor in dating and relationships. One of the most entertaining performances of the evening was by Mona Shaik, who added the perfect flavor to the show. 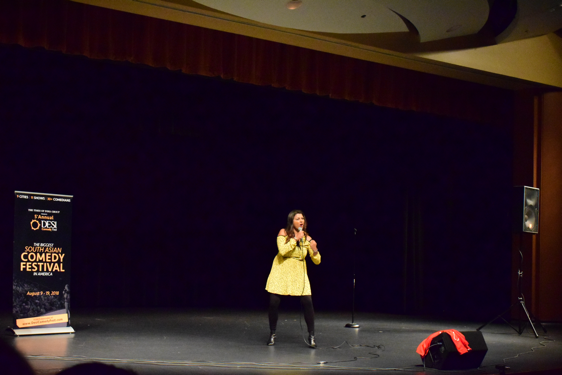 With her strong voice and acting, she grooved the audience completely to her engaging humor. Also, it is for the first time in the history of the Desi Comedy Fest that one third of its comedians are women. This diversity among the comedians was one major attraction of the show. With over 30 South Asian comedians from all over the US with diverse ethnic background of Indian, Pakistani, Bangladeshi, Iranian, Syrian-Mexican, Libyan, Japanese and Filipino, and Muslim, Jewish, Sikh and Catholic religious backgrounds, the festival was crafted to be one of the largest of its kind. It is the same cultural zeitgeist in the South Asian community that led to the inception of the Desi Comedy Fest in 2014. Nadkarni also showcased a wonderful show for the night with great comic timing and knowing expressions of Indian culture. The comedy fest has visited other Northern California cities including Mill Valley, Santa Cruz, Mountain View, Berkeley, Milpitas and Dublin. Definitive Book of Horror Movie Posters from 1920s to 1950s: "What Music They Make"